In early January Andersen Drive was closed temporarily as SMART performed rail welding work along the rail line. 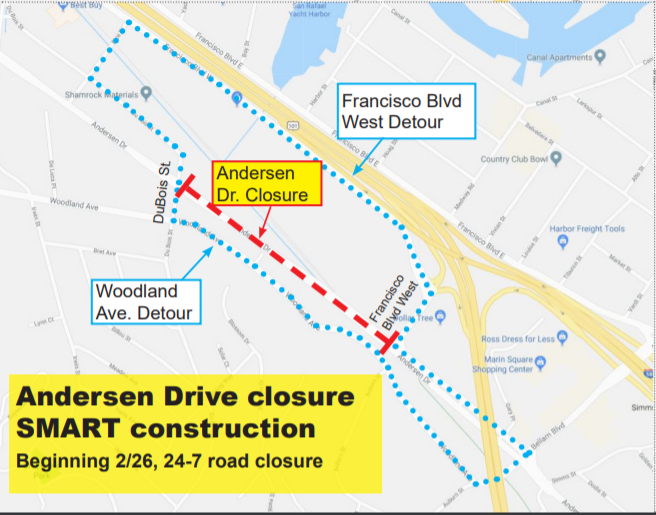 Starting February 26, the Andersen Drive closure will be reinstated, 24-7 for an estimated three months. SMART will be constructing the actual rail crossing across Andersen Drive and utilities will be performing important work relocating several key utility lines. The same traffic detours during the January closure will be put in place again on Woodland Ave and Francisco Blvd. West. Businesses along this portion of Andersen Drive will remain open and accessible from the DuBois St. closure.